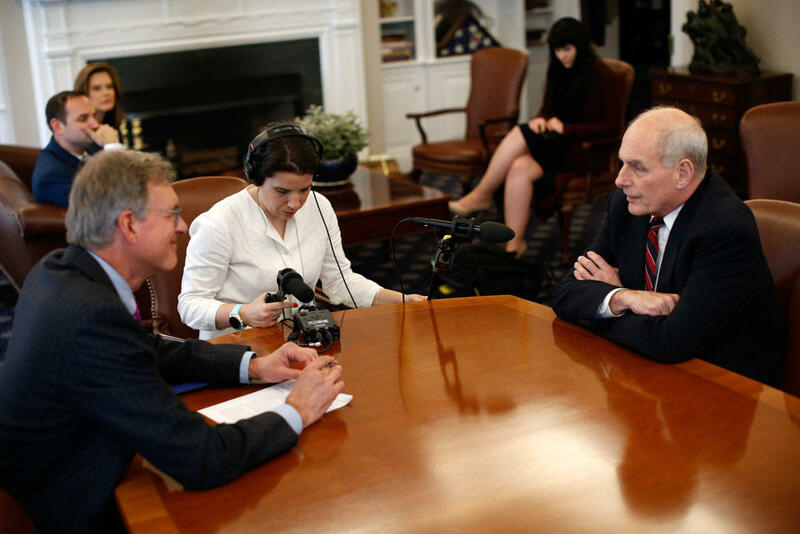 NPR correspondent John Burnett (left) and NPR producer Emily Ochsenschlager prepare to interview White House chief of staff General John Kelly. My last column on the burgeoning number of politician interviews on NPR's newsmagazines, many live (and then rebroadcast over subsequent hours), provoked a good deal of response. My essential point (channeling the frustrations of many listeners) was that the interviews, which have proliferated on NPR in the last year, too often do not add to listeners' understanding of the issues being discussed. A traditional piece reported by an NPR journalist can be fact-checked. The reporter can include important context or competing views. By contrast, the interview format largely does not allow for either of these, unless added by the journalist doing the interviewing. Show hosts do that far more often than not, but they cannot be expected to know, or catch, everything. And only very occasionally do the NPR newsmagazines pair interviews with newsmakers from opposing sides, as the weekend edition of All Things Considered did on May 6 with back-to-back interviews on the Republican and Democratic midterm election strategies. Even paired interviews can be unsatisfying, giving the listener little more than he-said, she-said conflicts over the facts. The May 7 All Things Considered interview with Marion Hammer, a longtime National Rifle Association lobbyist and former president, brought a number of listener complaints, which is why I am raising the issue again. Many felt the interview left an erroneous impression that Hammer's daughter died of gun violence. But more importantly, the interview did not add clarity to the NRA's position on so-called "red flag" laws, which allow for guns to be taken away from people who pose a significant risk to themselves or to others. Here's what Hammer said about such laws (it should be noted that the overall interview strongly implied she was speaking for the NRA but the question was worded in such a way as to leave open the impression she was speaking for herself) : "If there is evidence that the individual poses a danger to self or others, they should not have possession of firearms." But that left out important context about the NRA's position. As NPR's own Martin Kaste reported on March 19, the NRA's position is that red flag laws should "require the judge to make a determination of whether the person meets the state standard for involuntary commitment." That's a major caveat. A few days earlier, an interview with Paul Ryan, a vice president of the government watchdog group Common Cause (not the House speaker), also led to an unfortunate slip. Ryan said, of President Trump's lawyer Michael Cohen, "apparently they [the Dept. of Justice] were tapping the phones of his office for several weeks before that DOJ raid" on his office and home. NBC had indeed reported that Cohen's phones were being wiretapped earlier in the day. But NPR's newsroom had been very careful not to report on that all afternoon, because NPR's own reporting had not confirmed it. As it turned out, NPR was right to be cautious. NBC had to correct the report, which was inaccurate. After the erroneous information slipped in, NPR excised the statement from subsequent rebroadcasts and the transcript (one of those problematic stealth edits). Even so, many listeners had already heard the wrong information, which was not clarified by NPR. I'll come down (for now) off my soapbox on that topic. NPR listeners have been raising a related issue over many months, namely, whether the number of interviews is skewed to one side or the other of the political spectrum. In response to the requests, we counted. Included in our tally were interviews with federal and state elected officials, governors, White House and cabinet officials, think tank members if they seemed to be speaking in a partisan or surrogate role, and former administration officials, if the interviews were addressing specifically partisan issues. Essentially we wanted to understand if one side or the other was getting more opportunities to make its case. Here's what we found. From Dec. 1, 2017 through March 30, 2018, NPR's newsmagazines interviewed 121 Republicans, 137 Democrats and six independents who fit in those categories. Counting only federal elected officials, there were 60 from the GOP, 85 Democrats and five independents. That was partly offset by 14 White House or cabinet officials. As for governors, there were 11 Republicans to six Democrats (which broadly reflects the statehouse breakdown). The patterns varied by month. In January, the numbers were exactly even. Overall, the numbers were not wildly off balance. Who gets on the air is primarily based on the news but also is partly a function of who agrees to be interviewed—and that sometimes varies by story. Sometimes politicians don't want to come on air to be pinned down on thorny topics. We have shared the numbers with the newsroom for their consideration. And we will keep an eye on the issue going forward. Editorial researcher Annie Johnson contributed to this report.